I'm off to Puerto Vallarta for a long wedding weekend! With vacation on my brain these traditional Mexican inspired numbers caught my eye. Cotton embroidery, color pop and flirty flounces mark the trend. I prefer to keep hair simple and sleek and leave jewelry to large statement earrings. Maxi dresses are my current craving but I also fell for these shorter numbers from Leaves of Grass and Etoile Isabel Marant. These dresses are so pretty!! I am in love with the blue one. Have a lovely weekend. I absolutely love that middle blue one - gorgeous! the dresses are very beautiful, i love the outfit inspirations you put together! and i really like your blog that I just found, I follow you! perhaps you'll follow me back if you like my blog too? Love the maxis, so summery! I would live in maxi dresses every minute of every day if i could! These are great latin inspired maxis! Love the earrings too! Have an incredible weekend! Thanks for the follow! Maxis are huge for spring-great post and happy vacation!! Super cute picks! Love the blue dress! Love the second one! Have fun! I loveee the yellow maxi! adorable. These are so pretty and I love the big earrings with them! I love maxi dresses! They are always comfortable, yet stylish at the same time. I just found your blog. Love the yellow! Have a fantastic weekend! I love the bohemian vibe of a maxi dress! You picked the beautiful ones here! Hope you are having a wonderful day! the blue dress is wonderfull!! following u !! i would be very happy if u follow me back ! I love these long dresses you've picked out! 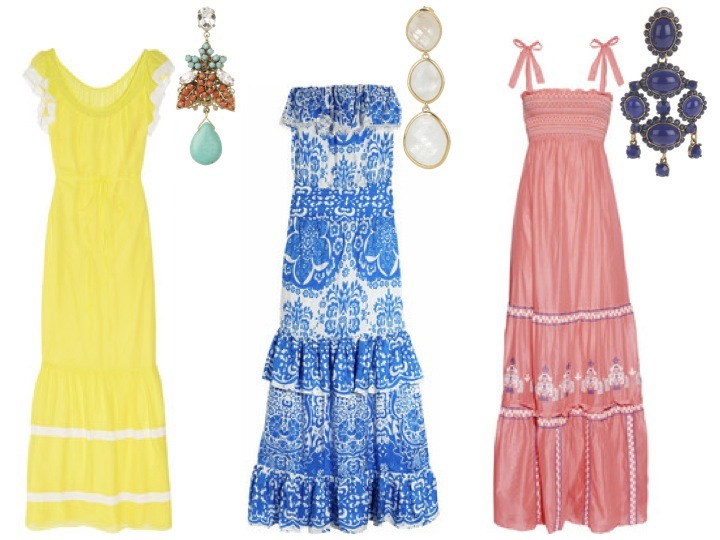 Love these dresses, I love the mexican feel when its warm out. I really can't pick a fav! I love every maxi dresses, but in special, with blue drees! Gorgeous, I love love the floral one. That blue one is to die for! I might need it for my upcoming vacation! i hope you had a fabulous weekend! i love these dresses. the pattern of the blue one is so beautiful! i adore your style today! GORG DRESSES! I love the middle one and the earrings are beautiful! :) Thanks for sharing. I would beg you to take me with you, but I'm just not well equipped to ride inside a suitcase (c: Loving the yellow number...have a absolute blast in Mexico! Cute dresses! I love the pink and blue one. Be sure to visit ShopWithKarenblogspot.com to enter our color block braclet give away for your chance to win! Love these looks! Perfect for the upcoming Cinco De Mayo fiestas! Great blog! Love all of the dress and earring pairings, very nice. And the earrings you have paired! Maybe you could take a peek at my blog? So many summer’y outfits and cute options here. Love your summer look! I'm jealous but what I did enjoy is the way you’ve pieced and put all those photos together.